Banner o Vietnam Fowk's Airmy. Slogan translates as "Determined tae win." The Fowk's Airmy o Vietnam an aa kent as Vietnamese Fowk's Airmy, is the Militar Force o the Socialist Republic o Vietnam. 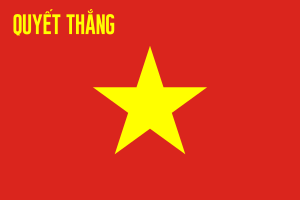 ↑ In the Vietnam Fowk's Airmy, the Grund Force haesna been established as an independent Command, aw o the grund forces, airmy corps, specialised airms belang tae the Meenistry o Defence (Vietnam), unner directly command o General Staff (Vietnam Fowk's Airmy). ↑ 1.0 1.1 International Institute for Strategic Studies (3 February 2014). The Military Balance 2014. London: Routledge. pp. 287–289. ISBN 9781857437225. ↑ "HISTORY – The Hmong". Cal.org. Archived frae the oreeginal on 12 October 2012. Retrieved 13 November 2011. This page wis last eeditit on 11 Februar 2018, at 20:35.